What do you understand by Accounts Payable? Accounts Payable is a process that refers to the money payable by a business company to its suppliers presented as a liability on a company’s balance sheet. It is separate from notes payable liabilities which are debts generated by formal legal papers. When an invoice is vouched for payment, an account payable is recorded in the account payment account book. Once an invoice is approved and recorded in the general ledger or account payable register, it is called vouched and it is termed as an outstanding and open liability since it has not been paid. Payables are often considered as trade payables, payables for buying physical goods that are documented in account and expense payables, payables for the acquisition of goods and services that are expensed. Advertising, entertainment, travel, office supplied and utilities all are common examples of expense payables. Account payable is a system of credit that suppliers propose to their customers by permitting them to pay for a product or service after receiving it and suppliers offer numerous payment terms for an invoice. Payment terms may encompass the offer of a cash discount for paying an invoice within a definite number of days. Account payables are typically bills from the Telephone Company, electric company, cable television or satellite dish service, newspaper subscription and more of such services in households. Householders commonly pay monthly through cheques, internet banking or credit cards. In business companies, there is a much broader range of services in the account payable register. The Account payable certification course by Brainmeasures emphases on explaining all the significant features of the course clearly. Account payable is an important area and plays a vital role in all the organizations and business companies. Account Payable is very important since it involves a company’s payments that are external of payroll. It is important for the account payable personnel to check for fake invoices as well. In the absence of a purchase order system, the chief responsibility of defense falls on the approving manager. Account payable staff should become acquainted with all the features and the corporate problems and issues such as the yellow pages ripoff files in which deceitfuloperativespropose to place an advertisement. The account payable system is usually carried out by an account payable department in a large corporation or by a small staff in a small or medium business company, or by an individual book keeper or by the owner of a small personal business. Whatever may be the size of a company, the main objective of accounts payable is to pay for the invoices that are genuine and perfect. Brainmeasures is an ISO certified leading online certification company well known for their high class teaching standards and skill testing. After getting enrolled in this course, you would receive and E-book that would guide you for the online exam. Upon successful completion of the online exam, you would be awarded the certificate by Brainmeasures. The average salary of an Accounts Payable Specialist is $44,387. Salaries vary depending on the qualification and experience of an individual. Begins with explaining the foundation of the accounts payable function. Discusses the master vendor file and where the process should begin. Explains about invoice processing and the reason why accounts payable exists. Explains about the checks- the original and the least efficient payment vehicle. Describes about purchasing cards and streamlining the payment processes for small purchases. Explains about electronic payment as the most efficient payment vehicle. Discusses about the operational issues and payments. Discusses about inaccurate payments and payment auditing and entertainment. Discusses about expense reimbursement, travel and entertainment. Explains about check and P- card payment and fraud detection and prevention. Explains about fraud and other types effecting the accounts payable function. Discusses about the accounts payable policy and procedure manual. Explains the regulatory issues effecting the AP function. How to use technology to run a more efficient accounts payable function. How to overcome the challenges in enhancing operational productivity in accounts payable function. How to enhance payment productivity. How to enhance AP more so that payments can be made in cash. How to build up better vendor relations. 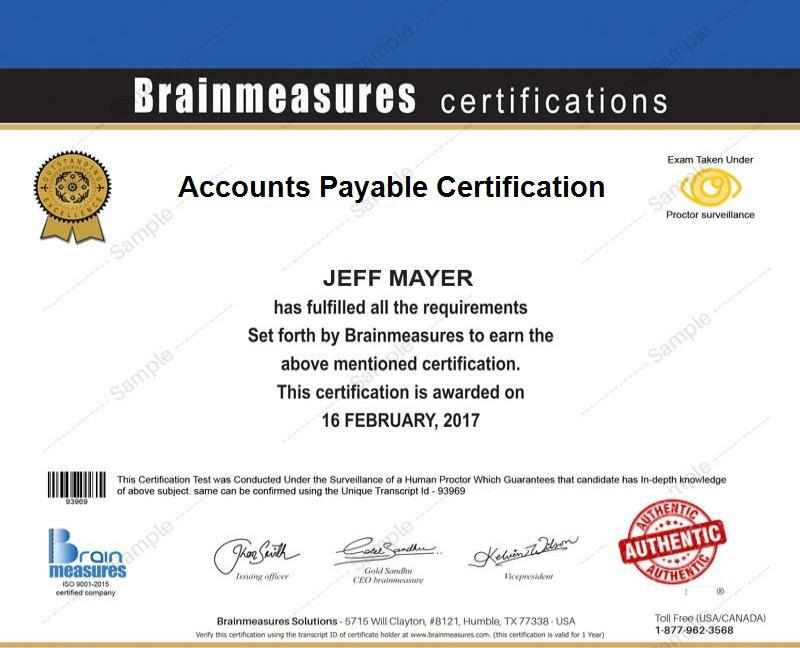 The Accounts payable certification course by Brainmeasures is extremely beneficial for individuals handling the accounts of any and every organization. Every organization can be highly benefitted by this system since it can enable you to optimize the working capital, sustain cash savings, and enable a long term supplier relationship management can help organization maximize their profits that would in turn help your company progress and stay ahead. Most of the companies today are on the look out to recruit individuals with the latest set of qualifications and expertise and there is a high demand for certified account payable professionals nowadays.